Over the New Year’s weekend, the people of Los Angeles were gripped by a rash of arsons that targeted vehicles and homes. The fires sent people scurrying from bed in the middle of the night, with children in arms, in a desperate attempt to avoid harm. An understandable fear gripped the community, with people parking their cars down the street so that, if the arsonist came, the resulting fire would not spread to their house, risking the safety of their sleeping families. The string of arsons was, apparently, the action of a single hate-filled man who was determined to inflict his anger on helpless targets. He went out into the night, applied accelerant to cars and set them on fire. I, like other biomedical researchers in Los Angeles, had a powerful, personal response to viewing these events unfold. It was only 30 months ago that an animal rights extremist, morally blinded by hate and rage, walked through the gates of my yard at 4 am and set my car on fire, risking my life and that of those who lived around me. I can still see the flames when I close my eyes, and I can sometimes still feel the heat of the fire on my face, so I knew very well what these new victims that I watched on television were feeling: fear, panic, sadness and total confusion. The extremist elements that claim responsibility for these actions often indicate that they cause no harm to people; they say that they limit their actions to economic damage (WARNING: link takes you to an animal extremist website). They claim to break windows, steal documents, free animals and – yes – set cars and homes on fire, but they often insist that they do not hurt or injure people. The claims that they cause no harm are proved hollow by the looks on the faces of people fleeing their burning homes on New Year’s eve. Extremist animal rights elements, like the man who set the New Year’s Eve fires, have one goal – not to cause financial losses to their targets – but to inflict psychological damage in the form of terror. In that sense, their targets are as much the people who have yet to be attacked as they are the individual whose car is on fire. The events of last weekend underscore the fact that hatred is not unique to animal rights extremists. But it does demonstrate how powerful and insidious these forms of attack can be and how essential it is for our broader civil society to reject the actions of those who use thuggish tactics to achieve their ends of their movement. On Friday, January 6, KCET, a Southern California PBS station, will re-air the story (‘Testing the Limits’) that addresses the harassment of Los Angeles researchers by local animal rights activists. You can watch it as it broadcasts (2/6 at 830 PM PST; 2/7 at 6 PM PST; 2/8 at 630 PM PST or 2/9 at 1030 PM PST); the program is also archived on their website (click here). Next Next post: Ignorance or Deception? There is no question at all that the late Mrs. Stevens and her husband, Roger, had a deep and longstanding commitment to advancing animal welfare and that the Animal Welfare Institute and its lobbying arm, the Society for Animal Protection Legislation, had great influence on promoting legislation and regulations intended to improve the well-being of animals. I heard Christine Stevens speak on numerous occasions, and in every case she began her remarks by saying that AWI was an animal welfare organization, not an animal rights organization. I believe that was her sincere intention. And, regardless of whether the “psychological well-being of primates” language came from Mrs. Stevens or Senator Melcher, I believe their intentions were honorable. But, there is more to the story. The reason it matters to some degree is that when I went to Senator Melcher’s office, I offered to prepare some language that would be more firmly based in what was known about primate biology and behavior and captive care. It was in response to that offer that he told me the language had come from Christine Stevens and that was the way it was going to stay. The rest is history, but not everyone knows the history, and there has been much polarization where there should have been constructive collaboration and cooperation. The final decision in ALDF v. Glickman (2000) established that the “environment enhancement plan” was to be provided, on site, to APHIS personnel and representatives of funding agencies (e.g., NIH), rather than being placed on file at USDA where the plans would be made available under FOI. By that time it had become quite clear that individuals and organizations mostly wanted access to plans as a means of additionally harassing research organizations. Unfortunately, several organizations that were once devoted to advancing animal welfare become too closely allied with extreme animal rights organizations and individuals, to the point that their agenda changed from fighting for decent treatment of animals to fighting against scientific research, regardless of its merits or the extent to which its methods were humane. People got caught up in taking sides. Hateful character assassination attempts were made–which were sometimes entirely baseless. We need to have civil discourse and constructive cooperation, rather than people lining up and shouting insults at each other. Senator Melcher met with me in his office for quite some time. I brought him a copy of my book, Captivity and Behavior, which includes reviews of primate development and behavior and advocates improved conditions for primates–including studies of methods of pair housing and management in social groups. We discussed the issue at length, and I expressed support for improving the quality of life for captive primates. I also indicated concern that the meaning of the legislative language would be so debatable that preparation of enforcing regulations would be drawn out and contentious rather than being timely and constructive. He explained to me that the omnibus farm bill was being ushered through the Senate by Senator Bob Dole, and the Doles and the Stevenses were close friends, and that the legislative language was supplied to him by Christine Stevens, and that was the way the language was going to stay. So, perhaps Mrs. Stevens did not supply the language; however, that was what Senator Melcher told me at the time. Some years later, after I had designed a much improved facility, he visited and told me “This is just what I had in mind. I could live in here!” He later published a positive paper in which he mentioned that renovated facility–which had been enabled, in part, by the language he introduced. I have always felt that we parted on good terms, and that we shared a commitment to improving conditions for captive primates. Our memories differ about our conversation in his office. Environment enhancement plans are to be reviewed by USDA officials or other officials with a need to know what is in them. They are to be supplied on demand at the facility and are to be examined and reviewed there. Their purpose is not to provide fodder for those who seek to attempt to find some fault with animal care. This principle was tested in a case that went to the US Supreme Court, and court agreed that enhancement plans do not have to be made available to the public. I would prefer if the committee to revise The Guide had mentioned the requirement to have a plan and had provided guidance on what should be in the plan. Across the years, I have prepared draft plans for a number of institutions on a consulting basis. In my opinion, it can and should be a substantial document that helps the institution provide improved care and housing for primates, and it should not be made into a political football or a device to generate challenges by those who oppose all research involving animals and are just looking for ways of stirring things up. 1. Christine Stevens accomplished incredible advances for animals during her lifetime, but in this instance, we need to give credit where it is due. Senator John Melcher came up with the language requesting “a physical environment to promote the psychological well-being of primates.” He did not get that language from Christine. In fact, though Christine supported the idea wholeheartedly, there was a worry the bill might reach an impasse over this language which Senator Melcher insisted be included in the bill. At the time, when researchers complained about Senator Melcher’s language, he told them they were welcome to offer some alternative language that got at what he wanted changed (which was to address the single-caging of primates in small barren cages that was the norm in primate housing). 2. The problem with the primate enrichment plans is that the research industry succeeded in ensuring that the plans were housed at the research facilities rather than submitted to USDA. It would have been far more sensible for them to go to USDA to be housed and reviewed, but then they would have been available to the public via the FOIA. 3. The most recent professional position (that I know of, sorry I didn’t ask Senator Melcher when I spoke to him) that Senator Melcher held was with the American Veterinary Medical Association here in DC (as I’m sure you know, he is a veterinarian). To suggest that the Senator was representing AVMA on the panel to revise the Guide is as wrong as the suggestion that he was representing AWI. Knowing him, he was representing the animals! I have asked Cathy Liss of the Animal Welfare Institute to respond to the question from David Jentsch about AALAC assessments and also to comment on what Joe Erwin wrote about AWI’s role in language to do with primate enrichment, but I want to go back and comment further on the omission of rats, mice and birds in the AWA. That an animal is “purpose-born” is irrelevant in terms of sentience and the need for humane treatment. Animals raised for meat are purpose-born, but the public has finally come to agree on the need for improved farm animal welfare. Will genetically engineered (or eventually cloned) human infants not deserve the same treatment as randomly bred babies? During the debate over human slavery, once the transatlantic trade in “wild caught” humans came to an end, it was argued by the pro-slavery side that all the slaves in existence at that time were purpose-born and that made it all right to use them as slaves. People who would not countenance any mistreatment of dogs and cats or rodents such as squirrels and chipmunks will do horrendously cruel things to rats and mice, or look the other way as someone else does it. About 20 years ago, a humane officer in New Jersey cited for cruelty a man who took a trapped rat into his front yard and set it on fire. The public was indignant that a humane organization would interfere with disposal of “pests” and the charges were dropped. It is, of course, fact that rodents invade homes, eat crops and stored food, and often are disease vectors. I’m not arguing that one doesn’t have the right to defend against home invasions of unwanted animals or that populations of rodents do not need to be controlled for public health reasons. I would argue for the elimination of excessive cruelty and such devices as glue-traps, and encourage the development of rodent birth control methods as a humane alternative to killing. However, the conditions that make people respond with fear and loathing to the presence of rodents in their homes do not apply to purpose-bred rodents for laboratory use. In labs, they are not unwanted and they are not disease vectors (unless you purposely give them a disease). Rodents are intelligent and sentient, and if you go by the logic of the Great Ape Protection Act and claim that animals should be protected from exploitation on the basis of genetic similarity to humans, then you will have to protect rats and mice before protecting dogs and cats. It is not acceptable that rats, mice and birds are excluded from AWA regulations. Facilities that only use rats, mice and birds for experiments and testing are subject to little, if any, scrutiny. The AWA will not have credibility with animal advocates as long as this situation persists. Hmmm. Too many things to respond to, but here goes. NIH funded institutions are required to comply with USPHS policies and The Guide, which has now been officially accepted by NIH. Enforcement occurs through NIH OLAW. USDA does not require more than the AWA regs stipulate, however, AAALAC does require institutions to do what is required of them–including meeting whatever NIH requires, if the institution receives NIH funding. The role of AWI has been interesting and is relevant. Christine Stevens supplied the “psychological well-being” language to Senator Melcher to insert in the amendments to the AWA. He told me so at the time. I was not opposed to improving the regulations, but I expressed concern about the legislative language (the terms were ill-defined, undefinable, and not even understood for humans, let alone nonhuman primates). In fact, in the 1980s, my input regarding revision of The Guide was to try to find some way of changing the regs to reward “optimal” care and housing, rather than setting minimum standards. I’m not sure how that could have been done, but the requirement of an institutional animal management plan could have been helpful in that regard. As it was, my suggestion of a primate enrichment plan was accepted and included in the AWRs. Strangely, that requirement is barely mentioned in The Guide. And interestingly, former Senator Melcher, who served as a lobbyist for AWI’s lobbying entity after he was not reelected, served on the committee that revised The Guide this time around. Even so, we keep on trying to ensure safe and effective means of improving the quality of life for captive primates…. Is there a published source or reference for those assessments? I would like to learn more about this. “that they cause no harm to people; they say that they limit their actions to economic damage” this is bull crap. They might not cause harm to people, but they sure like to if they got a chance. There are vocal AR supporters who bang on and on about how ‘vivisectors (and other ‘animal abusers’) are sadists! !1′ and then when there is a report of how one suffered (eg describing fear, reports of hunters dying, etc) they seem to take such pleasure in that. “Revenge is sweet’ blah blah. But it never seems to be about ‘A bull fighter has been gored. This is good news in the long run for the bulls, as perhaps such events may lead to a complete ban on bullfighting’ it’s more ‘haha i hope he suffered lots, go the animals!’. Or similar when NIO published your impact statement or whatever it was for your AVO on Camille. They were so pleased with your description of the fear, even though you’re not going to stop your work so 0 animals were saved. I can of course understand not being sympathetic eg I wouldn’t be sympathetic to a child molester but I wouldn’t take pleasure in their suffering unless it means children were saved. But I suppose this is what rage does to people. I believe what you say, but it is going to be necessary to get all institutions using animals in research, testing, and education (including commercial establishments) to comply with the high self-imposed “standards of conduct of research” that “well exceed regulatory requirements,” by persuading the regulatory agencies to incorporate into their regulations the new standards developed independently at “most every institution of higher learning in this country.” If animal researchers (as a body) ask the regulatory agencies to upgrade their regulations and request Congress to amend the AWA to include all vertebrate animals instead of just a few species, it will happen. While I support extending regulatory protection to all warm-blooded animals involved in research in any privately- or publicly-funded laboratory in the United States, I do not believe a change to the Animal Welfare Act is the way to do it, unless one also undoes much of the regulatory structure that has been created over 30 yrs and starts from scratch (recalling that it took YEARS to hash out the current scheme after the passage of 1985 amendments). Nor do I think you can come up with a single set of standards that will easily apply to all vertebrates. Rather, I support the requirement that all institutions accept, implement and comply with the PHS Guide for the Care and Use of Animals, with the AVMA Guidelines on Euthanasia and other scientifically-sound protocols on the care and use of laboratory animals. A “few” species? All mammals short of purpose-born rodents of the genus rattus or mus are already covered. There are more than one thousand genera (and more than 5000 species) in the mammal class. All are already covered by the AWA. Actually, the number of mammalian species not covered by it is “few” (only rats and mice), rather than the other way around. The Animal Welfare Act excludes only certain types of birds, rats and mice from its coverage of warm-blooded animals. That exclusion is mostly meaningless because the Public Health Service requires at all NIH or NSF funded institutions comply with the “Guide for the Care and Use of Animals” to receive funding, and the Guide covers all vertebrate animals (cold and warm blooded). So, the gap has ALREADY been closed for the most part. You correctly indicate that there MAY BE a gap when it comes to small business operations that are privately funded, but many of them are AAALAC accredited, meaning that they also meet and exceed the terms of the Guide. So, actually, we believe the number of institutions that do not meet USDA and/or PHS standards to be remarkably low, and I have never seen any data to contradict that. Please let me know if you have such data; I’d like to see it. Nevertheless, I absolutely support changes in the legal and regulatory framework that require all animal research institutions (whether publicly or privately funded) to – at a minimum – comply with the “Guide for the Care and Use of Animals”. Amending the AWA by simply striking the exclusion of mice/rats/birds is not the way to do this. Starting again with an entirely new structure would have to be undertaken, and the federal funding for enforcement would have to be identified and allocated. How many times more rodents are used in laboratories than other mammals? Thousands of times more than all the other mammals put together? Millions? Excluding rats and mice––along with birds––from the Animal Welfare Act was a monumental, and deliberate, omission. “I respectfully disagree with David in that NIH is not an enforcement agency so there is no true oversight/enforcement of the Guide by an independent body. Why not merge the two ideas, and cover rats, mice and birds under the AWA and require that the standards NOT exceed those in the Guide (or use the Guide as the basis for the standards)? I would certainly support this–and it would ensure that there wasn’t a whole new set of standards that researchers had to worry about. We actually tried to do this back before rats/mice/birds were removed from the law, BUT those that wanted them removed didn’t care whether the standards were the same as the Guide or not, they simply didn’t want these species covered. We had multiple meetings with Senator Harkin’s staff about this very subject. Those facilities not currently covered by the Guide–and for whom these requirements would be new would be the small colleges and universities that don’t get federal funds and only use rats, mice and/or birds. Assessments have repeatedly been done of the failure of AALAC to ensure that animal welfare requirements are met. The site visits only occur once every three years and are carefully planned in advance. I will say that those that are accredited typically have more resources so they have the funds to provide better care–but that doesn’t always happen. Actually, standards of conduct of research at most every institution of higher learning in this country well exceed regulatory requirements. As you probably already know, maintenance of voluntary accreditation from AAALAC (Association for the Assessment and Accreditation of Laboratory Animal Care) shows this since AAALAC standards in many ways exceed regulatory (USDA and PHS) requirements. In addition, every University I have ever been at has an IACUC that has adopted and requires additional self-imposed policies that exceed regulatory requirements, sometimes to the consternation of researchers. The list of changes to scientific procedure that are designed to improve animal welfare are many, and to my knowledge, almost every single one was conceived of and implemented by a scientist: from new analgesics that were designed in animal pharmacology labs to new minimally invasive methods for blood collection to alternatives to whole animal use in toxicity testing (see https://speakingofresearch.com/2011/10/12/all-in-a-days-work-scientists-promote-alternatives-to-live-animal-research/). These are all examples of where advances in animal welfare occurred independent of regulatory requirements. This happens every day. Those that don’t want to see it, will not, but it will happen anyway. Please do not imagine that I wish to defend any self-proclaimed animal activists who engage in arson, personal intimidation, or any other sort of terrorist tactic. I find it almost impossible to believe that people who are sensitive enough to care about animals would do such things, unless they are emotionally disturbed. I remain convinced that the majority of these “activists” have just latched onto the cause as a means of expressing sociopathic tendencies within a social movement, though they may convince a few desperate, depressed, and guillible people that violence is going to solve the problem of violence towards animals. Terrorism is distinguished from random acts of violence by having an agenda. Maybe all arsonists have some traits in common, but one could just go on a spree of violence without trying to coerce someone into doing or not doing something. And a person on a spree of arson may not even know the victims, much less hate them. The impact on the victims may be essentially the same, but I think I would rather be the victim of random violence than think someone is out to get me personally. Current anti-animal-research rhetoric is “littered with distortions [and] exaggerations” because much of the material is decades old, but there was no shortage of verifiable atrocities to write about and illustrate with photographs (most of them taken by the researchers themselves). It would help if animal advocates could be convinced that those crimes against animals were committed by previous generations of animal researchers and that things are not like that now, but that is going to require a greater degree of transparency and also a commitment by animal researchers to higher standards than are currently required by regulatory agencies. I’m sure there are folks who assault researchers who would claim their motives are loftier than the motives of the guy who was torching cars in LA but they are more similar than different and the impact on victims is the same. These are terrorist acts fueled by hatred against people not known to the perpetrator. 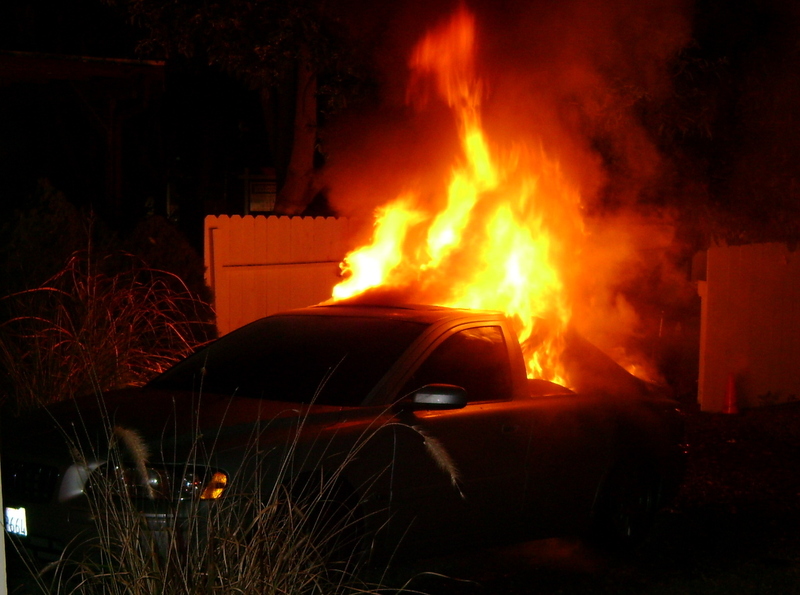 I think it is reasonable to conclude that, from a clinical psychology perspective, there is a lot in common between the individual that set my car on fire and the New Year’s weekend arsonist. While the trigger issue is different, similar personality and temperament factors had to be present to lead to the outcomes they did. The feelings and emotions they experienced that drove the behavior was likely very much the same. But it’s not just him. This kind of hateful, dysregulated behavior is exhibited again and again amongst many (but not all, nor even most) anti-animal research “activists”. The SoCal Connected piece shows the hatred, animus and vitriol that fuels the activities of those who carry out the protests on out campus and at our homes. Is it not hateful to wish for me to “burn in hell”, to shout epithets at me, to curse my neighbors and to laugh when you see the fear you cause in others? The hundreds upon hundreds of emails we receive from activists, each containing threats and insults, show the same, as do the endless list of animal activism websites. This is not one person, nor even one group of people. It’s a growing trend in the animal rights movement. Hatred is indeed not unique to animal rights extremists. Many activists who have never torched a car feel a great deal of hatred for researchers, as well. But it’s important to make sure that the broader community realizes that hatred lies at the heart of a great deal of anti-research rhetoric because it explains why that rhetoric loses touch with reality, why its littered with distortions, exaggerations and frank lies and why “any means necessary” is a tool so many activists are willing to embrace. It is not my intent to minimize the harm done to you by the person who set fire to you car, and your antagonism towards fanatics who engage in terror tactics is quite understandable, but from the links you provided to the story of the Los Angeles New Year’s arsons, it isn’t clear that there was any similarity between the motives of the arsonist who burned your vehicle and the arsonist who went on a car-burning rampage. This is a gigantic understatement, don’t you think: “The events of last weekend underscore the fact that hatred is not unique to animal rights extremists.” Sadly, hatred has been a prominent feature of humankind throughout the historical record.